Aikatsu! – 160 | Mezashite! She actually has the most Ojou-sama name I’ve ever heard in my entire life. Were there any notes? I don’t think so. Her name means camellia, which is the flower you can see above. For more of them, I suggest watching Yuri Kuma Arashi. Also, this episode confirms my assertion that the CG improved this season. Compare the performance to episode 123 after you watch. tbktn knpk. Haven’t seen the episode yet, but I think Tsubaki kinda looks like Aguri Madoka from DokiDoki! PreCure. I was beginning to think that being a perfect lady doesn’t necessarily mean having a clue. Omg an ojou idol, time for a waifu number 2- err, yeah, thanks for the release. Fever appeal? That’s a new one on me, did I miss the memo? Fom Aikatsu Wikia : A Fever Appeal is a new introduced appeal system to the 2016 Series and are appeals thats level surpasses that of a Special Appeal. This appeal however, is different from the Constellation Appeal and Story Appeal, as it is an upgrade version of current existing brand appeals. Pretty much. Most 2016 series cards have FEVER! printed on the bottom corner, and if you have a coord with them all you have the chance to do a fever appeal. But yeah it doesn’t really mean anything. Just incentive to collect 2016 cards? So it sounds like by using a fever appeal you can get your appeal level higher than the previous maximum from using a standard special appeal. As you say, new card incentive, but a game changing one for higher scores on the leaderboards. 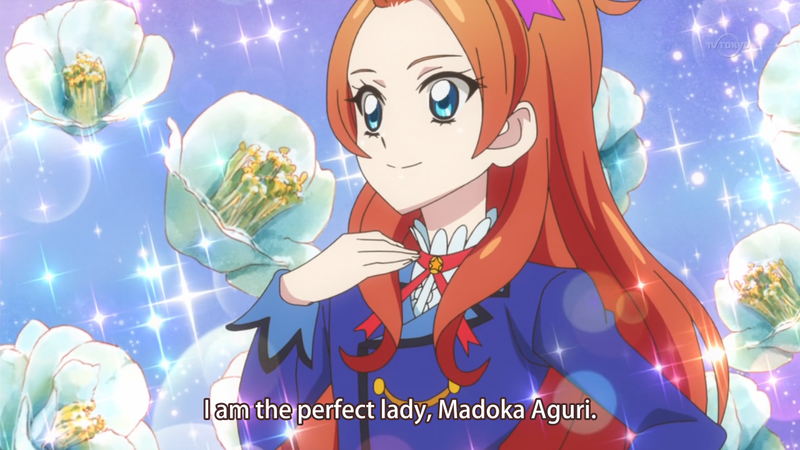 I get occasional information from the Aikatsu wikia, it’s a short Google away. They elected not to explain this season’s McGuffin in the anime for whatever reason.